BALTIMORE, MARYLAND – We are on our way to the future. Not that we know what will happen, but we’ve been looking at the broad patterns of history. Most likely, they will repeat themselves… and surprise everyone. Over the last few days, we’ve looked at three of them. Are we about to witness the biggest new trend of our lifetime? A former money manager, famous for predicting the renter trend, legal marijuana wave, blockchain boom, and Bitcoin bubble is going on record with his next prediction – as a new industry goes from essentially $0… to potentially $400 billion over the next few years. First, stocks go up and down in a cycle that seems to last 30-40 years, peak to peak. Stocks have been falling since October. Movers and shakers can move and shake the stock market. Most investors are hoping they can keep prices moving up forever. But it’s never happened. Every boom is followed by a bust. Would it surprise you to see prices cut in half? It shouldn’t. It happened 10 years ago… and 19 years ago… and 53 years ago; on that last go-round, stocks lost 80% of their value over a 14-year slump. Bonds go up and down in a similar cycle – but it takes twice as long. Interest rates hit a low in the late 1940s. The next low didn’t come until 2016 – a lifetime later. Since then, bonds have been falling, too. Again, the feds can do mischief in the bond market, but they can’t stop the credit cycle. 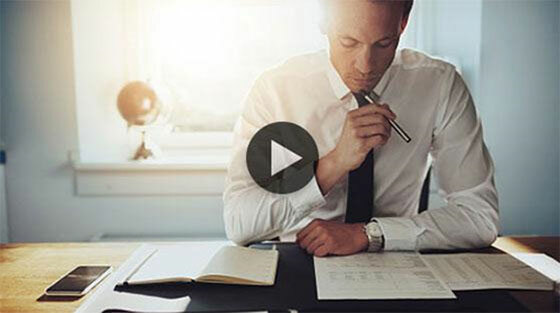 Would it surprise you to have to refinance your house at a 10% interest rate? It shouldn’t. At the last top in yields, in 1980, homeowners were lucky to get mortgages below 18%. There is also a political pattern. It is much less obvious. And the politicians themselves deny it; they claim they can get whatever outcome the people want. And most citizens believe them. If things go bad, they think the “wrong” party got in office… or it made “mistakes.” They believe politicians will eventually get it right… after they’ve exhausted other possibilities. Here at the Diary, though, we’re serenely cynical. We count on the sun to rise in the morning. We trust our burgers to be edible. And we expect the markets and the feds to do predictable things. In the present context, for example, there is almost no chance that the Fed will normalize interest rates. And there is almost no chance that Congress and the White House will reduce spending or raise taxes – even to prevent a death spiral of debt and inflation. Once underway, empires, love affairs, and financial calamities have to run all the way to the end. In America today, it is almost impossible – politically – to cut government spending or to raise taxes. That leaves debt as the only way forward. Over the last two years, U.S. federal debt rose by about twice as much as GDP. Those were supposed to be boom years. And the House, Senate, and White House were under the control of the Republicans, who were supposed to be concerned with fiscal rectitude. This year, the deficit is projected to be around $1 trillion. And now, with the economy sinking towards recession, markets ready to crash, and a Democratic majority in the House, hold your breath; it’s trillion-dollar deficits… and rising… from here to eternity. Everything shifts on February 1, so there’s no time to lose. As you know, the money system is corrupt, unfair, and misleading. Oh, Dear Reader, weren’t you paying attention? We’ve looked at how it bids up prices for financial assets but leaves wages untouched. Feeding the new, counterfeit currency into the asset markets, we explained, the feds boosted the wealth of the rich by some $30 trillion since 1980. The middle and lower classes, who did not own financial assets, didn’t get a penny. And today, the typical working stiff has to schlep for twice as long to pay for the typical house or pick-up truck. Ah, but that’s the point, Dear Reader. The system endured because it was unfair, not in spite of it. It did the work it was meant to do on behalf of the people who ran it. In the next few months, the world’s first affordable, long-range electric vehicle is expected to hit U.S. roads… And it’s not a Tesla. The Tesla Model S – widely known as the best electric car today – can only last 335 miles on a single charge. 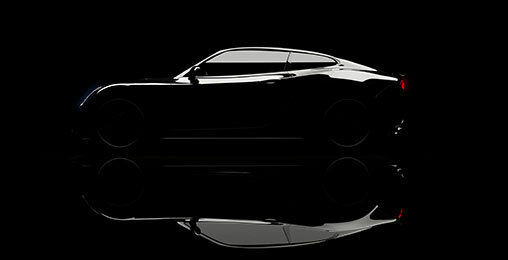 This new electric vehicle has the potential to drive 100 miles further, and costs much less to build. It’s able to achieve this quantum leap in performance because of a brand-new technology, one that could be in every single electric vehicle on the planet in the near future. Early investors stand to make a fortune as it swamps a tiny company with a 22,705% profit surge. There are always some people who get control of the government and figure out how to use it for their own benefit. That was true of the Big Man in prehistoric tribes. It was true of the chiefs, kings, and emperors who dominated governments in early historic times. And it is true of the elites who dominate the U.S. government today. Today, the emphasis is on fraud over force. But the goal is the same: to separate the outsiders from their power, money, and status. And to that end, no more cunning, more elegant, or more effective flimflam has ever been developed than America’s fake money system. It’s shimmied some $30 trillion from the middle classes to the elite. And not one person in 10,000 knows he’s been scammed. Editor’s Note: Today, something different for dear readers. In lieu of our normal Market Insight, we share a message from Dan Denning, Bill’s coauthor on The Bill Bonner Letter. Many dear readers know that Dan recently embarked on a project to uncover “boltholes” in America’s heartland. These are safe, quiet towns that can serve as your refuge in the event of disaster… or just whenever the modern world becomes a bit too noisy. Greetings from Auckland, which is not the capital of New Zealand (Wellington is). Auckland IS the biggest city on New Zealand’s North Island, with 1.6 million of the country’s 4.8 million occupants living here. It’s a port city with the Hauraki Gulf and the Pacific Ocean to the East and the Tasman Sea (and Australia) to the West. 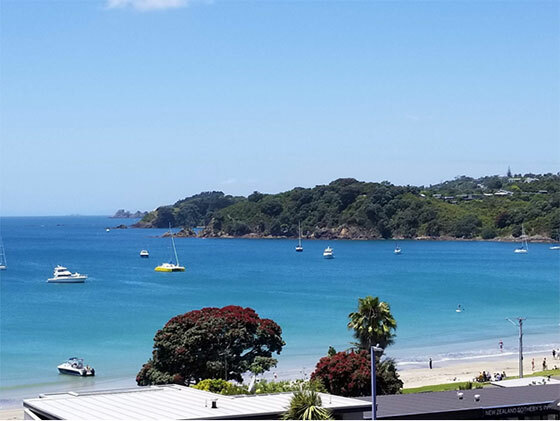 I arrived in late December (and am staying until mid-March) to see if New Zealand is just a bolthole for billionaire Silicon Valley oligarchs (more on that in the next issue of The Bill Bonner Letter), or whether normal Americans like you and me should put it on our list of potential cities to move to. Also, I’m here because I spent last winter looking for boltholes in the Rocky Mountains, after which I got acute bronchitis and spent six weeks in bed on antibiotics. I was determined not to make THAT mistake again. And since I have Australian citizenship, living in and working from New Zealand is easy. Australia and New Zealand make it easy for their respective citizens to travel and work in the other country. Americans can visit for 90 days on a tourist visa. Any longer, and you’ll need to make other arrangements. Just what arrangements – including how to legally gain residency here – I’ll cover in the upcoming issue of The Bill Bonner Letter. That letter will be published on Wednesday, January 23. 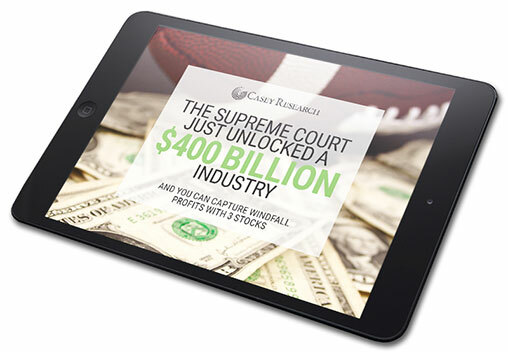 In it, you’ll find evidence that shows owning stocks for the long run is a losing strategy. You’ll also find a thoughtful piece of equity analysis from my colleague Thompson Clark at Focus. In the meantime, if you’re missing the sun and blue skies, here are a few snaps of Auckland landmarks to tide you over. I’m staying mainly on the North Island this month and in early February. If you’re nearby or would like to meet up and tell me about New Zealand’s bolthole potential, get in touch! If you’re on the South Island, I’ll be there in the second half of February and early March. I’ve been to the North Island six times now. But never the South. It’s earned the nickname “Middle Earth” for the scenes shot there for The Lord of the Rings movies. If you’re in Queenstown, Christchurch, or Dunedin, let me know and we can meet up for a coffee or a beer. You can contact me by going here. 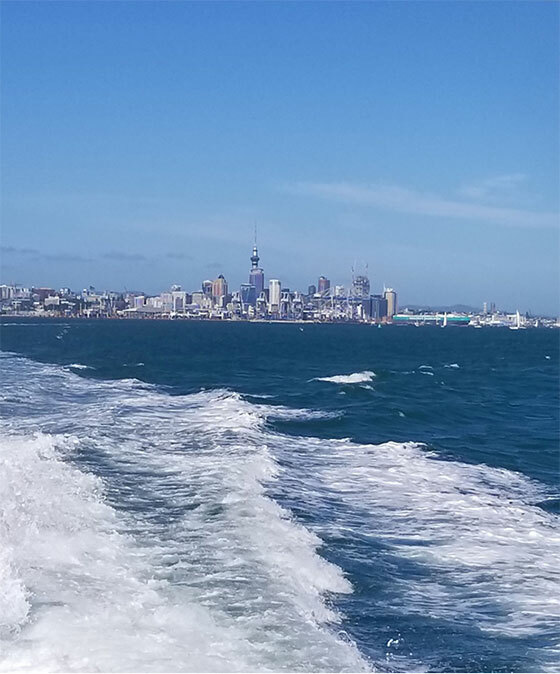 Auckland recedes in the background on the 40-minute ferry ride to Waiheke Island, New Zealand’s third-largest island – a tourist and wine mecca in the Hauraki Gulf. Looking down on Oneroa Bay and Oneroa Beach on Waiheke Island. Lonely Planet named the island the world’s fifth-best region to visit in 2015. 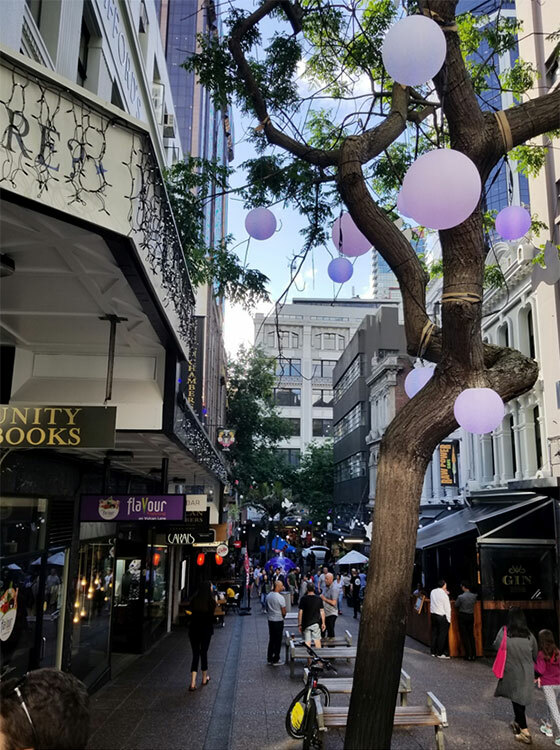 Vulcan Lane in the Central Business District. If you find yourself there and hungry (or thirsty), try the Green Lipped mussels at the Occidental over a Belgian beer. Huge and delicious, they come from the western side of the Coromandel Peninsula. View back to the city from Rangitoto Island. 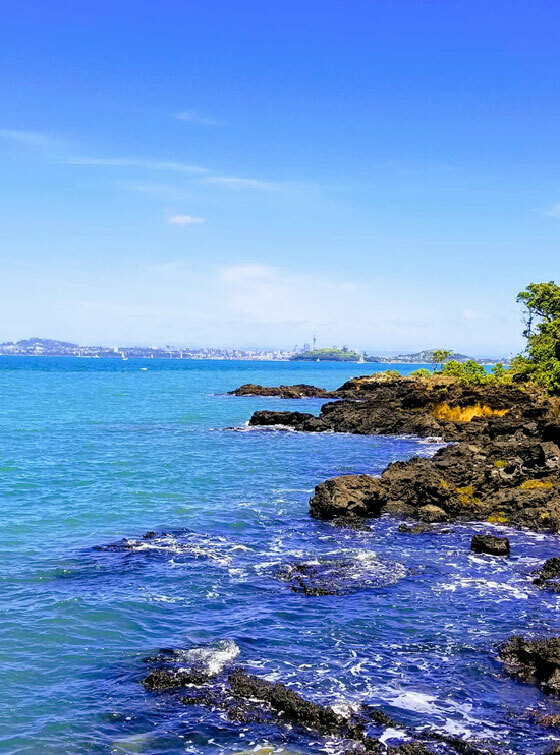 Rangitoto is a 600-year-old volcanic island you can hike up, with excellent views from the summit back to Auckland and west to Motutapu and Waiheke Islands. 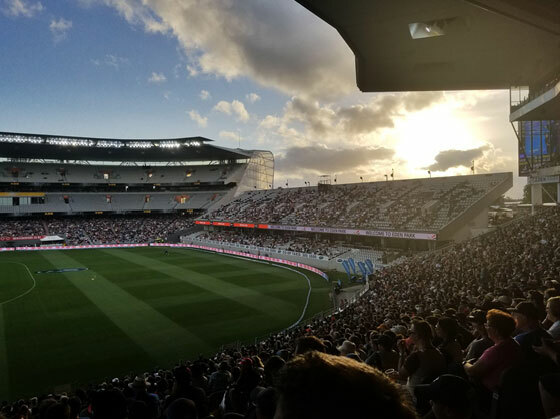 Sunset at Eden Park during a 20-20 cricket match between New Zealand and Sri Lanka (New Zealand won). Rugby is the national sport of New Zealand, and the “All Blacks,” as they’re called on account of their black jerseys, are very good (although were recently beaten by Ireland). 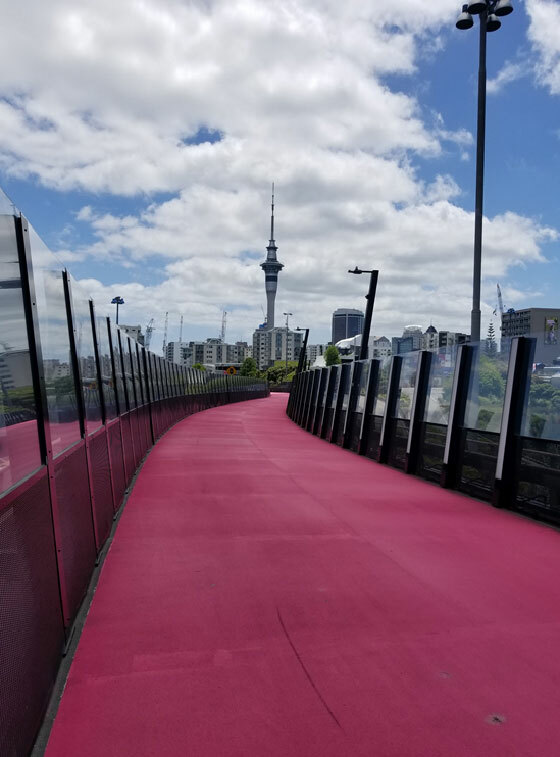 With many bike paths, Auckland is friendly to cyclists. But it has steep roads and streets, similar to San Francisco and Pittsburgh. It’s not for the faint of heart, although the climate is mild and pleasant. P.S. I’ll deliver the full issue of the The Bill Bonner Letter next Wednesday. If you are a reader, be on the lookout for it then. And if you’re not a reader, then join Bill and me by going right here. In January 2018, American corporations were greeted with the biggest corporate tax cut on record, courtesy of President Trump and Congress. The argument was that letting companies keep more of their money would lead to an economic boom. So what did corporations actually spend their money on? You already know, don’t you, Dear Reader? Once the darlings of the bull market, Big Tech stocks like Facebook, Apple, Amazon, Netflix, and Google have fallen from grace. Relative to earnings, the prices of these so-called FAANG stocks are at their lowest levels ever. So, is Tech dead? Or is it a bargain? What will be President Trump’s defining legacy? According to Casey Research’s Nick Giambruno, it won’t be tax cuts… tweets… or even “The Wall.” Instead, Trump could go down as the president that brought legal pot to America. Hah! Insanity, what you write. No one even talks about the law, not even you and your company. Article IV section 4 of the U.S. Constitution tells us a lot, but you don’t quote the law. No one does. READ IT! It is indisputable and undeniable. Illegal immigrants and others like them are invaders. Why are we embracing invaders AND giving them benefits? Are we nuts or just brain dead? Thanks for writing, Bill. You are one of the smartest guys on the keyboard. Some feedback on your letter today: A common argument of illegal immigrant defenders is that they do the work Americans won’t do. This is just a supply-and-demand question. Americans won’t do the scut work because the pay is too low. If the border was controlled, the price of labor would rise and Americans would pick oranges. The comparison of illegals to the legal inhabitants of Baltimore is isolated by geography. In Montana, I would much rather see locals coming toward me. The murder rates in border towns are low because illegals aren’t crossing the border to live on the other side of the border. They are just passin’ through. I would love to hear your thoughts about the incentives that the undocumented immigrants have to break our laws. No.1 on my list is free schooling – a $10,000-$20,000 theft from taxpayers for every child they enter into a U.S. school. Free emergency room/healthcare, especially if they live in New York City. They often have false documents and receive other welfare benefits that they are not eligible for. I accept many of your arguments about the wall. There are other arguments for some limited immigration, such as payments for medical care, payments for unemployment, effect on education, teachers (educating children that do not speak English, etc.). Many Americans will not do menial jobs because of government payments! That was the first article I have completely agreed with you. This made-up “Emergency Border” problem is indicative of the current state of our country. Very sad. I live in the middle of Californian agricultural land. Almost every day, we see “these people from the south of the border” working in the field picking fruits, strawberries, lettuce – everything we eat daily. It is VERY hard, back-breaking work. No other “Americans” are willing to work in these jobs. They did not take away American jobs. Without them, the price of our vegetables will go up sky high. The affluent Americans NEED these cheap laborers, hotel maids, dishwashers, and field laborers in order for us to live comfortably. As you said, they are hard-working and polite people. Bill, we are a nation of laws, and our society runs – for the most part – in an orderly fashion because of those laws. Our immigration laws should be enforced. In order to do that, a wall is necessary and makes sense financially. The costs to the welfare system related to illegal immigrants and other costs are real and substantial. 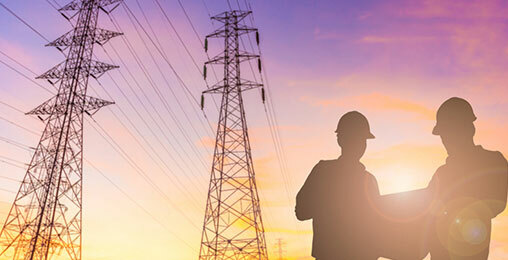 As for cheap labor, the middle-class jobs are disappearing and labor costs have not risen since the 1970s with regard to what a dollar could buy. Maybe it is time that we revalue the labor as well as education costs and the type and quality of education. We are a nation of American citizens, not illegal aliens. There should be one language – and that language is English. Immigrants are welcome; they can come and assimilate. If they do not want to assimilate, they should live where their lifestyle, language, and beliefs are widely held. I have always believed the old adage, “fences make for good neighbors.” I feel this applies to the border wall, just writ on a large scale. Hey, no one has the right to enter anywhere without proper passage. Every person murdered by an illegal is unjustifiable. Illegals cost our nation from $30 billion to $300 billion, depending on the evaluation. So $25 billion is a cause quite worthy. You are welcome to sponsor whoever you wish. And if they meet the proper channels, then you can keep them in your house, but make sure they work and do not become a burden to U.S. citizens. I hate to disagree with your commentary in “The Trouble With the Wall,” but to my dismay, too many people have this perception about all immigrants. I am not going to say that all of them are milking the system, but 80% of them are. I am an immigrant myself. I came to the U.S. when I was 17 years old. I am 63 years old now, and I have seen it all. Therefore, I can tell you are wrong, very wrong! I know my people, and unfortunately, they fool most American people, especially Liberals, because it’s convenient to them. But they don’t fool us Mexicans that came to this country legally and have worked hard all our lives. Think of it as your reliable “cheat sheet” for predicting which stocks are about to skyrocket – several days or weeks in advance.